RIDER BALANCED CONTROL: Rider Balanced Control gives the rider: 1. Flatter cornering without sacrificing the fun factor. 2. More precise handling in all conditions. 3. Better control in big bumps AND chatter bumps. PRO-XC™ REAR SUSPENSION: The completely redesigned geometry of the PRO-XC progressive-rate rear suspension is optimized for the best performance and Rider-Balanced Control. Through innovative Polaris engineering and construction, the suspension is both lighter and stronger, featuring: 1. Lightweight, forged aluminum rear crank. 2. Completely redesigned crank and pivot. 3. Front torque arm was moved rearward to control pitch, increase travel, and improve the rail profile. AXYS® PERFORMANCE SEAT: The AXYS Performance seat utilizes a high-performance seat foam, and the seat design is narrower in front to provide greater maneuverability. 1. The seat is lighter without compromising comfort. 2. Improved ergonomics and stability. 3. Seat top features a gripper material that helps keep the rider in place. 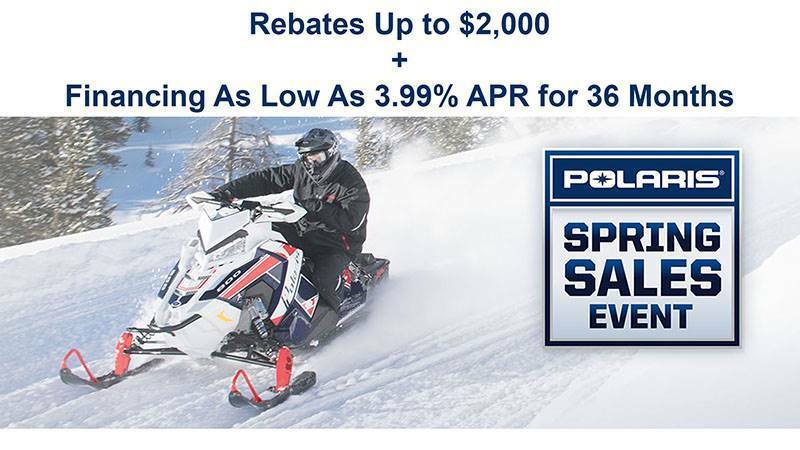 POLARIS INTERACTIVE DIGITAL DISPLAY: Exclusively from Polaris - the most advanced instrumentation in snowmobiling. This 4.3 in. high resolution, full color, LCD digital display provides a rider with information including: 1. Sled performance: Speedometer, tachometer, dual tripmeters, average speed, max speed, engine / trip hours & odometer Sled operating conditions: Coolant temperature, diagnostics & maintenance warnings. 2. Riding conditions: Air temperature, time of day in 12 or 24-hour clock format. 3. Bluetooth™ functionality: Enables the gauge to communicate with the rider’s cell phone and provide notification of incoming calls or texts. Displays phone battery & signal strength. 4. GPS / Mapping Capability: A compass is standard, & full-featured GPS can be installed to provide directions & information about services such as fuel, restaurants, lodging & Polaris dealerships. Customize the GPS to operate with North Up or Course Up navigation depending on your preference. 5. Ride Planning Feature enables you to plan a ride using Ride Command, save it as a GPX file, and transfer it to the display through the USB interface. LED LIGHTS: All models built on the AXYS® platform feature standard LED headlights. LED headlights deliver the industry’s best lighting: 1. Nearly 1 lb. lighter and high beams are 80% brighter than incandescent lighting. 2. Color temperature or output of the lights (the “whiteness” of light, reported in Kelvin) is 5000K, closely matching daylight. 3. LED headlights last the entire lifetime of the sled. A major durability enhancement over traditional incandescent headlights which experience filament burn out. 4. For constant visibility and enhanced safety, the low beams remain on at all times. Even when the high beam is activated, there is never a period of no light. INTEGRATED STORAGE: Storage was designed and developed right along with the AXYS platform, so it installs securely and features seamless, integrated styling that matches the sled’s design lines. 1. Compression-molded materials provide semi-rigid storage and enhanced styling. 2. Sturdier zippers provide better cargo security and protection. 3. Installs without tools. PREMIUM FIT & FINISH: Interfacing surfaces between body panels and components are shorter for minimized gaps. 1. Interfaces are strategically located in recessed areas. 2. Styling of storage elements results in clean, integrated lines. 3. Components are engineered for functionality and styled for the best styling. 600 CLEANFIRE® ENGINE: The 600 Cleanfire® engine is part of the Polaris family of Liberty engines built in the USA. This engine is a 600 cc, liquid-cooled, SDI engine that provides proven reliable performance, instant acceleration, easy starting and great response. ELECTRONIC FUEL PUMP: Electronic oil pump eliminates power-robbing gear drive – and provides more precise, improved oil delivery for performance and durability as well as a 35% reduction in throttle effort. Requires no adjustments.